Indian Institute of Technology, 1989. My research interests are in developing novel, multinuclear (23Na, 17O, 13C and 1H) magnetic resonance imaging and spectroscopic techniques for the early diagnosis and quantification of physiological and functional aberrations in pathologies such as arthritis, stroke, cancer and Alzheimer’s disease. Our pulse sequence developmental approaches exploit quadrupolar spin-dynamics, polarization transfer, multiple quantum coherences, indirect detection via chemical exchange and spin-locking T1ρ MRI for studying molecular dynamics in biological tissues in vivo. Specifically, T1ρ and Sodium MRI techniques are designed to map proteoglycan molecules (e.g. aggrecan) in cartilage as a biomarker for early arthritis in vivo. T1ρ MRI is also targeted to impart novel contrast in various tissue types (brain, connective tissues and tumors), and to detect metabolically produced H217O for studying cerebral blood flow and cerebral oxidative metabolism. Recent developmental work on chemical exchange saturation transfer (CEST) based MRI methods is focused on measuring endogenous but low concentration metabolites in the brain, such as glutamate, myoinositol and creatine to address central nervous system disorders. In addition, a creatine CEST method is currently being explored to measure high-energy phosphate metabolism in the myocardium in heart disease. 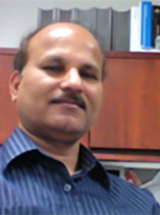 Dr. Reddy's research include developing novel, multinuclear (23Na, 17O, 13C and 1H) magnetic resonance imaging and spectroscopic techniques for early diagnosis and quantification of physiological and functional parameters in pathologies such as arthritis, stroke, cancer and Alzheimer's disease. Nanga RPR, DeBrosse C, Kumar D, Roalf D, McGeehan B, D'Aquilla K, Borthakur A, Hariharan H, Reddy D, Elliott M, Detre JA, Epperson CN, Reddy R.: Reproducibility of 2D GluCEST in healthy human volunteers at 7T. Magn Reson Med. May 2018. Puneet Bagga, Stephen Pickup, Rachelle Crescenzi, Daniel Martinez, Arijit Borthakur, Kevin D’Aquilla, Gaurav Verma, John A. Detre, Joel Greenberg, Hari Hariharan and Ravinder Reddy: In vivo GluCEST MRI: Reproducibility, background contribution and source of glutamate changes in the MPTP mouse model of Parkinson’s disease. Scientific Reports 8((1)): 2883, Feb 2018. Krishnamoorthy G, Nanga RPR, Bagga P, Hariharan H, Reddy R. : High quality three-dimensional gagCEST imaging of in vivo human knee cartilage at 7 Tesla. Magn Reson Med. 77((5)), May 2017. Bagga P, Haris M, D'Aquilla K, Wilson NE, Marincola FM, Schnall MD, Hariharan H, Reddy R. : Non-caloric sweetener provides magnetic resonance imaging contrast for cancer detection. J Transl Med. 15((1)): 119, May 2017. Cai K, Tain RW, Zhou XJ, Damen FC, Scotti AM, Hariharan H, Poptani H, Reddy R. : Creatine CEST MRI for Differentiating Gliomas with Different Degrees of Aggressiveness. Mol Imaging Biol. ((2)), 225, April 2017. Crescenzi R, DeBrosse C, Nanga RP, Byrne MD, Krishnamoorthy G, D'Aquilla K, Nath H, Morales KH, Iba M, Hariharan H, Lee VM, Detre JA, Reddy R. : Longitudinal imaging reveals subhippocampal dynamics in glutamate levels associated with histopathologic events in a mouse model of tauopathy and healthy mice. Hippocampus 27((3)): 285, March 2017. Kogan F, Stafford RB, Englund EK, Gold GE, Hariharan H, Detre JA, Reddy R.: Perfusion has no effect on the in vivo CEST effect from Cr (CrCEST) in skeletal muscle. NMR Biomed. ((1)), January 2017. Shanmugan S, Loughead J, Nanga RP, Elliott M, Hariharan H, Appleby D, Kim D, Ruparel K, Reddy R, Brown TE, Epperson CN. : Lisdexamfetamine Effects on Executive Activation and Neurochemistry in Menopausal Women with Executive Function Difficulties. Neuropsychopharmacology 42((2)): 437, January 2017. Roalf DR, Nanga RP, Rupert PE, Hariharan H, Quarmley M, Calkins ME, Dress E, Prabhakaran K, Elliott MA, Moberg PJ, Gur RC, Gur RE, Reddy R, Turetsky BI: Glutamate imaging (GluCEST) reveals lower brain GluCEST contrast in patients on the psychosis spectrum. Mol Psychiatry January 2017. Bagga P, Crescenzi R, Krishnamoorthy G, Verma G, Nanga RP, Reddy D, Greenberg J, Detre JA, Hariharan H, Reddy R. : Mapping the alterations in glutamate with GluCEST MRI in a mouse model of dopamine deficiency. J Neurochem. 139((3)): 432, Nov 2016.